We interrupt your regularly scheduled blogging to bring you today's special programming. Most people don't realize that many an actor's films can be worked out into a presentable timeline; creating a single life in film. The Non-Review has endeavored to give you these road maps, starting today with Michael Keaton. While a name for his character is not important, since chronologically Bruce Wayne falls first, we will refer to him in the timeline as Bruce. 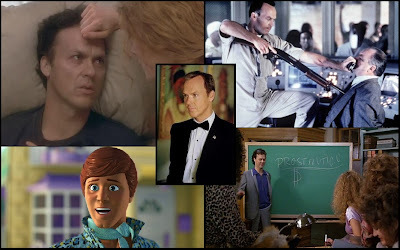 Now, without further ado, Micheal Keaton: A Life In Film. Love the fractured timeline w/ clones! Maybe he should have married a different prostitute! Did you ever do a "by the numbers" on him? End up as a toy for his granddaughter - hilarious! And damn, he must've found my clone machine.